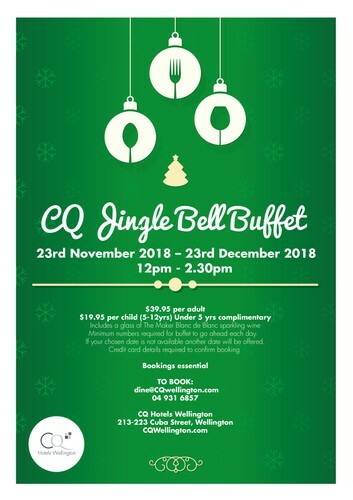 Enjoy our scrumptious Jingle Bell Buffet at CQ Hotels Wellington with your friends and colleagues this festive season! Includes a glass of The Maker Blanc de Blanc sparkling wine. Under 5 years old complimentary. A minimum number of bookings required for date to go ahead. If your chosen date is not available an alternative date will be offered. To book: dine@cqwellington.com or 04 931 657.